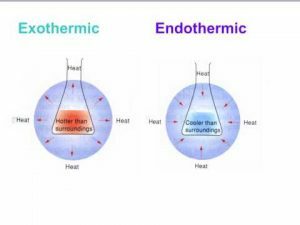 When heat transfers from the system to the surrounding , the internal energy of the system decreases and this process is called Exothermic process , When heat transfers from the surrounding to the system , the internal energy of the system increases and this process is called Endothermic process . According to the relation between ΔH° for the reactions and its internal energy , we can classify the chemical reactions into Exothermic reactions and Endothermic reactions . The reactions that produce heat to the surrounding causing the increase in its temperature . The heat transfers from the system to the surrounding which leads to decrease the temperature of the system and increase the temperature of the surrounding . ΔH° has a negative sign because heat content of the products is lower than that of the reactants . Example : Reaction between hydrogen and oxygen gas to form water . The exothermic reactions are accompanied with producing an amount of heat because the sum of heat content of the products is less than that of the reactants and according to the law of conservation of energy , the decrease in heat content of products must be compensated by releasing an amount of energy . The reactions that absorb heat from the surrounding causing the decrease in its temperature . The heat transfers from the surrounding to the system which leads to increase the temperature of the system and decrease the temperature of the surrounding . ΔH° has a positive sign because heat content of the products is higher than that of the reactants . Example : Decomposition of magnesium carbonate to magnesium oxide and carbon dioxide . The endothermic reactions are accompanied with absorbing an amount of heat because the sum of heat content of the reactants is less than that of the products and according to the law of conservation of energy , the decrease in heat content of reactants must be compensated by absorbing an amount of energy . During the chemical reaction , the bonds in the reactants are broken and new bonds in the products are formed as the chemical bond stores chemical potential energy . Bond energy is the amount of energy absorbed to break the bonds or released energy during the formation of bonds in one mole of the substance . The breaking of bonds is an endothermic process and needs to absorb an amount of energy from the surrounding , So , its ΔH has a positive sign . The formation of bonds is an exothermic process and needs to release an amount of energy to the surrounding , So , its ΔH has a negative sign . The Algebraic sum of absorbed and released energies during the chemical reaction represents the change in heat content of this reaction ΔH . ΔH = Absorbed energy during the breaking of bonds ( positive sign ) + Released energy during the formation of bonds ( Negative sign ) . When the released energy during the formation of bonds in the molecules of the products is higher than the absorbed energy during the breaking of bonds in the molecules of the reactants , So , The reaction will be exothermic and its ΔH° value will have a negative sign . When the absorbed energy during the breaking of bonds in the molecules of the reactants is higher than the released energy during the formation of bonds in the molecules of the products , So , the reaction will be endothermic and its ΔH° value will have a positive sign . The average bond energy of ( C — C ) equals 346 kJ/mol means that the absorbed ( or released ) energy during braking ( or formation ) of this bond in one mole of it , equals 346 kJ . The concept of average bond energy is used instead of the bond energy because each bond energy differs according to the type of compound and its physical state .